Jeffrey Gitomer's bestselling work in which he shares his tips on how to be a successful salesperson has a new edition and is now available on audio. He provides motivational advice and practical techniques for initiating, maintaining, and closing a sales presentation. Written in a breezy manner with short, easy-to-remember suggestions, this audio will be popular with persons just getting started in this field or those needing an inspirational pep talk. In an area where there are literally dozens of works already available, The Sales Bible will prove helpful to anyone who listens to it. 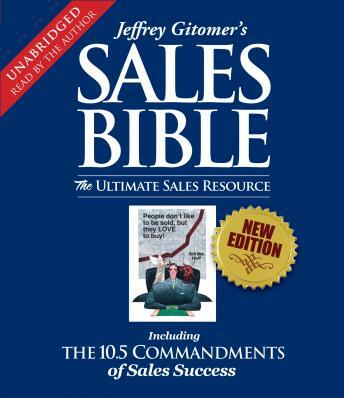 Jeffery Gitomer's Sales Bible has been completely revised and redesigned to resemble his distinctive bestselling Little Book series, helping the millions of fans he has won since its publication connect it to this blockbuster series, and assuring a major new life for this category-defining classic.